Mymazn is professional manufacture of server book, we have different models, below is the summary. If you have any suggestions of how we can improve this product, please send email. We value your opinions as we strive to improve and update our products and service so as to please our customers and supply their needs. If there is any problem with this product, please send us details by email. We will reply within 24 hours to resolve it for you. Your satisfaction is guaranteed! Made by sparkling and shining glitter material, it's absolutely the most glamorous and dazzling server book. With clear coating, it's smooth and doesn't come off on stuff while being used. Can be cleaned with wet cloth. 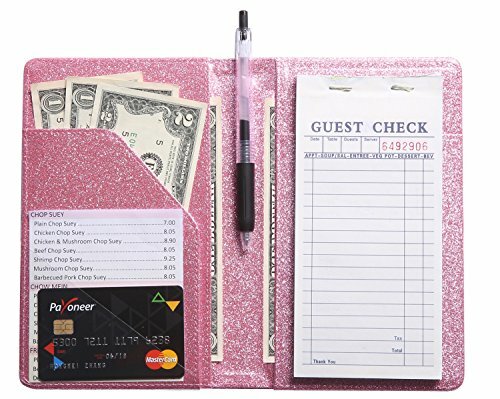 7 different pockets for note, money, check receipt, daily food special, help you get organized. If you have any suggestions of how we can improve this product, please send email. If you are not happy with the purchase, please send email too, we will send you refund or replacement immediately. View More In Menu & Check Displayers. If you have any questions about this product by Mymazn, contact us by completing and submitting the form below. If you are looking for a specif part number, please include it with your message. 25 BETTER QUALITY #3315 RED FIVE PANEL BOOKLET - 10-VIEW - 8.5" WIDE x 14" TALL - DOUBLE-STITCHED Leatherette Vinyl Sewn Edge. Gold metal corners. SEE MORE: Type MenuCoverMan in Amazon search. 25 BETTER QUALITY #3141 BLACK TRIPLE PANEL BOOKLET - 6-VIEW - 8.5" WIDE x 14" TALL - DOUBLE-STITCHED Leatherette Vinyl Sewn Edge. Gold metal corners. SEE MORE: Type MenuCoverMan in Amazon search.